his is not an imaginary "artist's conception" of what Christ may have looked like. 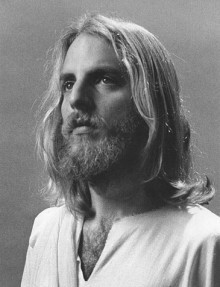 It is, in fact, simply a portrait from life of a young New York man wearing a white robe. 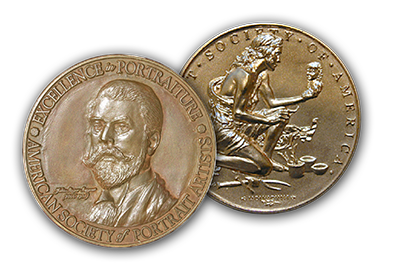 John Howard Sanden recalls: "It was a question of finding an appropriate model. 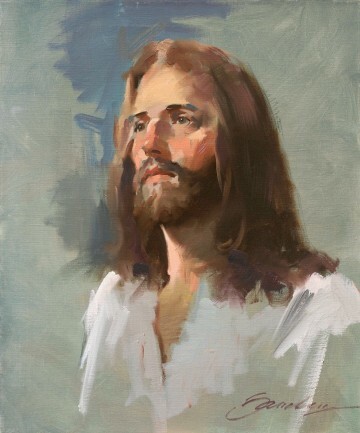 I had agreed, in 1980, to paint a large portrait of Christ in a series of Sunday morning seminars at the Fifth Avenue Presbyterian Church in New York City. I'd be glad to do it, I had said, but I would need a model. An important subject like this cannot be just "made up" or imagined. But where to look for an appropriate model?" "It was two weeks before the series was to begin. The great jazz musician Dave Brubeck was presenting his annual Christmas cantata at the church on Sunday afternoonalways a popular, crowd-pulling event. I sat with my family in the south balcony of the church, surveying the immense throng gathering for the program. To my astonishment, there before us, in the main floor on the aisle, sat a young man with shoulder-length hair and a beardand a wonderful "look" in his face." "I left my balcony seat and made my down to the auditorium floor to speak to him. His name was Jay Friedkin; he was a film student at New York University; his uncle was the well-known Hollywood producer William Friedkin; he was Jewish, had grown up in the neighborhood, and lived with his mother just three blocks from the church. Jay Friedkin had never before set foot in Fifth Avenue Churchhe had dropped in for the Brubeck concert. And yes, he would be happy to pose!" Jay Friedkin of New York City. "My wife made a white robe and, two weeks later, the painting began on Sunday morning before a very large audience at the church. I first painted a head-and-shoulders study (reproduced here) and then began the large 70 by 54-inch canvas. 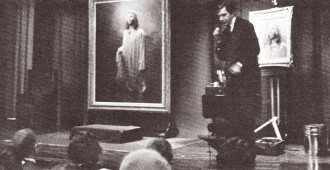 At the conclusion of the four weeks, the church staged a "receiving line" where the audience was invited to come onto the stage for a closer look. My model Jay, wearing his white robe, stood by the painting, shaking hands and greeting parishioners. It was a highly unique scene." A rapid preliminary study, painted before the audience at the church. Oil on canvas, 24 by 20 inches. 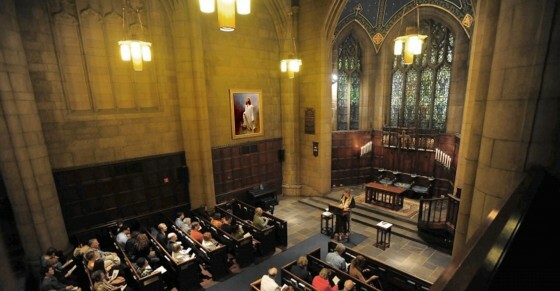 at Fifth Avenue Presbyterian Church, New York. Avenue Presbyterian Church, 7 West 55th Street, New York City. the model for Christ, Jay Friedkin. 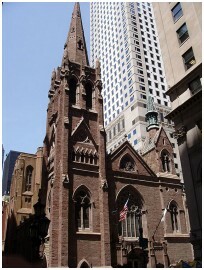 Presbyterian Church at 7 West Fifty-Fifth Street in New York.